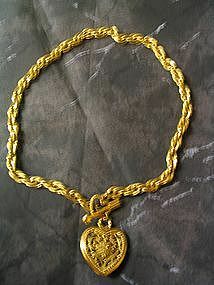 Heavy goldtone toggle necklace with no manufacturing information (there could possibly be some mark, but I just can't find it). The chain, excluding the pendant and arrow is approximately 18 inches and if you measure the piece including the pendant it is approximately 20 1/2 inches in length. I am not sure of the age - I bought it used about 2 years ago. The center of the heart has a raised tiny flower, which is repeated on the other side. The pendant is almost puffy, with a hollow center, in fact when I bought it, I thought it was a locket, but it does not open. The photo is making the necklace look a bit brighter than it is, because it has a duller finish. It is not wear, but possibly from age. I will be glad to provide additional photos of any area. I need your zip code to calculate the postage.